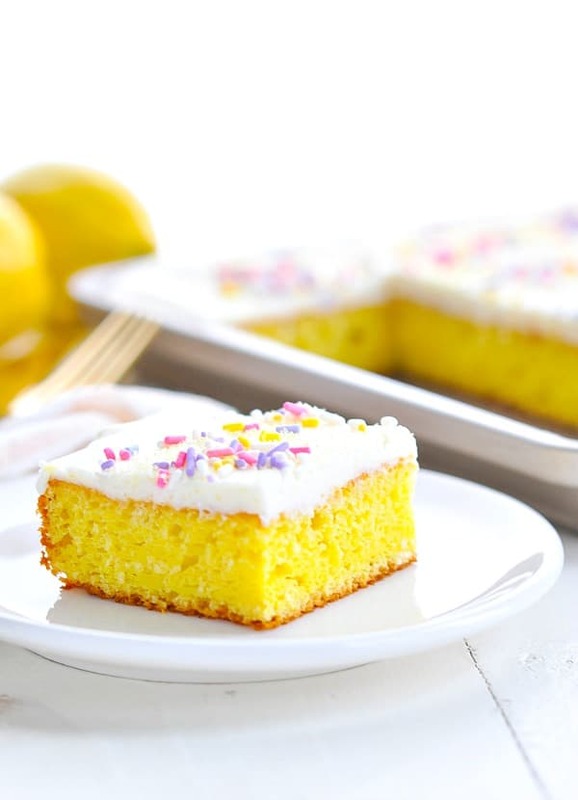 With help from a boxed cake mix, Fannie's Frosted Lemon Bars are a perfect easy dessert to welcome Spring! 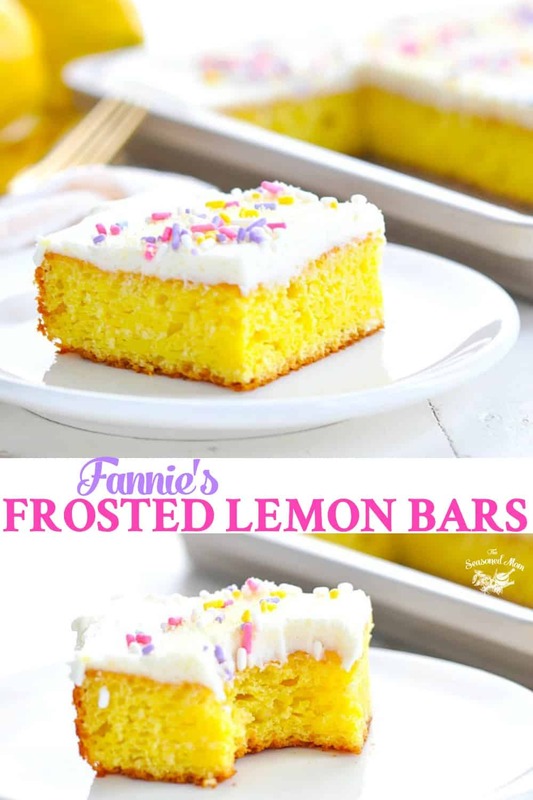 With help from a boxed cake mix, Fannie’s Frosted Lemon Bars are a perfect easy dessert to welcome Spring! The refreshingly sweet and slightly tart squares are slathered in a thick coat of cream cheese frosting for the ultimate treat! 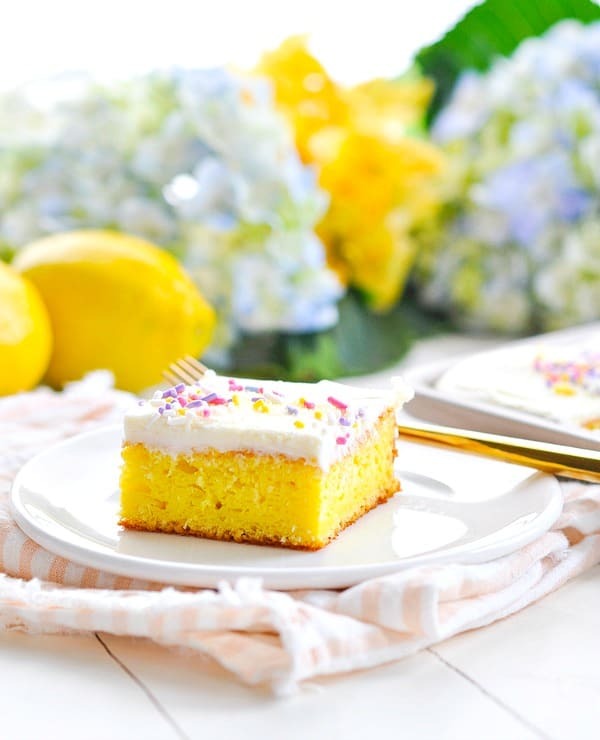 What is it about spring that just begs for bright, fresh, lemon-flavored desserts? 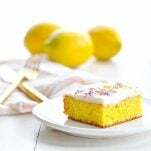 Whether I’m looking for an easy potluck treat, serving something special for a Mother’s Day brunch, or adding a festive dessert to an Easter buffet, Lemon Bars are always a crowd-pleasing option! Classic lemon bars are typically made with a shortbread crust, topped with a tangy lemon curd filling, and finished with a dusting of powdered sugar. These lemon bars, on the other hand, kick it up a notch! They’re like a cross between a lemon sheet cake and a dessert bar, since they don’t include a shortbread crust (or any lemon curd at all). Oh, and that cream cheese frosting! It is absolute perfection. The recipe originally came from my neighbor, Fannie, who also shared this Easy Cheesy Broccoli Casserole with us last fall. Fannie calls them “Lemon Pie Bars,” and while I debated calling them a “Lemon Cake,” I stuck with “bars” in the end. After all, my husband, who doesn’t even like cake, DEVOURED these lemon bars. That’s right…I said it: they’re better than cake! 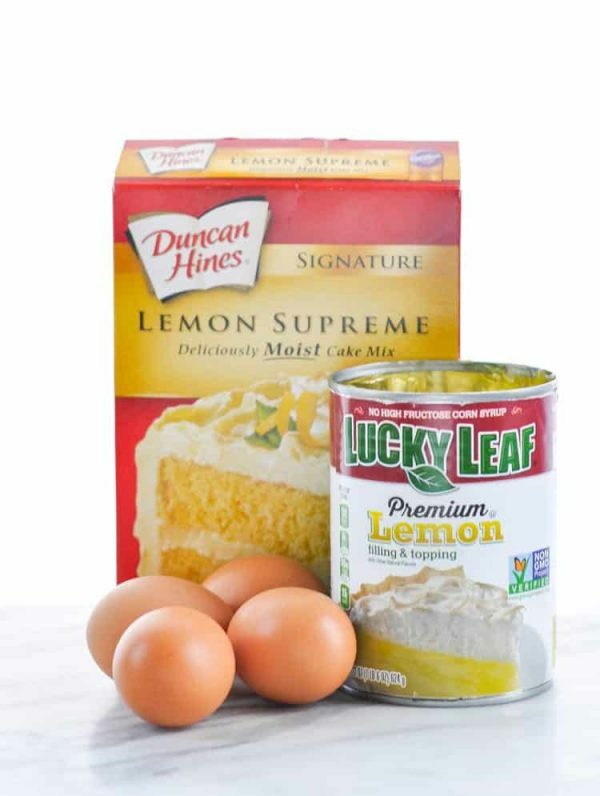 In a large bowl, use an electric mixer to combine cake mix, pie filling, and eggs. The batter will be thick, but still spreadable. It’s fine if you have some lumps in the batter. Spread batter into prepared baking pan. Bake for 30 minutes, or until golden brown and cooked through. Allow bars to cool on a wire rack. Once the bars are completely cool, prepare the frosting. Combine cream cheese, sugar, butter, and vanilla extract in a large bowl. Mix with an electric mixer to combine the ingredients, and then add 1 teaspoon of milk. Mix again until completely smooth and fluffy. If the frosting is still too thick, you can slowly add one more teaspoon of milk at a time until it reaches the desired consistency (I did not need more than 1 teaspoon of milk to get the frosting to a spreadable consistency). 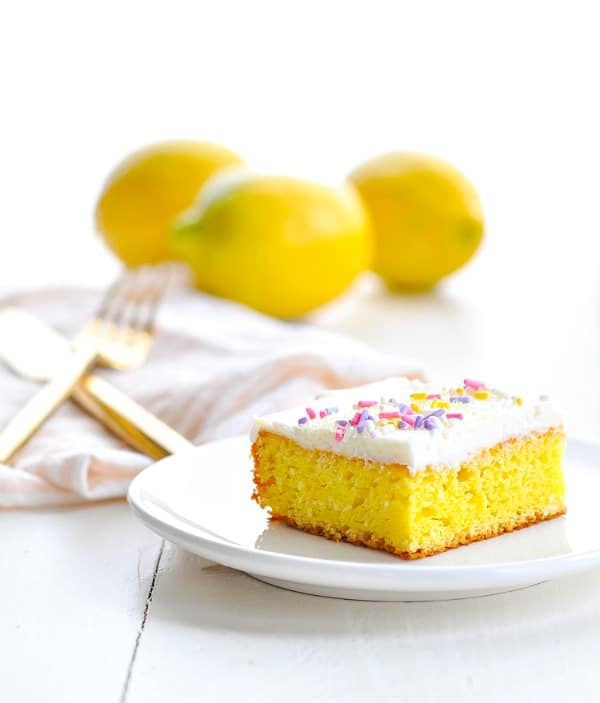 Spread frosting in an even layer on top of the cool lemon bars. Slice and serve immediately, or store bars in the refrigerator. These lemon bars are dense (without being heavy), and incredibly moist. 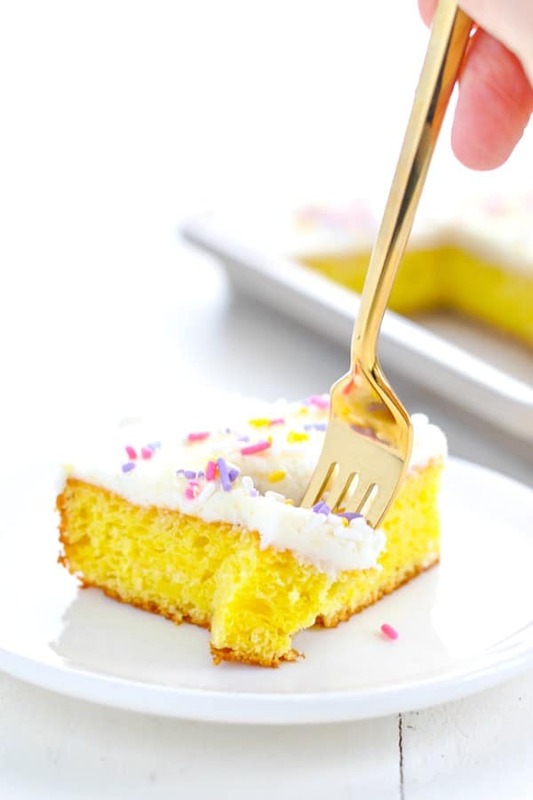 They are thinner than a piece of cake, so you can easily serve them to kids at a party and just let the kids eat them with their fingers — like brownies. That’s what my boys do! 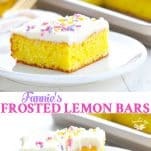 No matter what you call them, I can assure you that these easy Frosted Lemon Bars are a wonderful way to usher in the new season on a very sweet note! Make sure to lightly grease your baking pan so you can easily remove the baked bars. You can also line the baking pan to be extra safe. Fannie recommended using a 10-inch by 15-inch baking pan, so that’s exactly what I did. I have not tested the recipe with a different size pan, although a 9-inch by 13-inch pan would probably work well, too. The smaller pan, however, will result in thicker (more cake-like) bars. If you have a pan that is slightly larger than 10 x 15-inches, that would likely work as well (you will just have thinner bars). 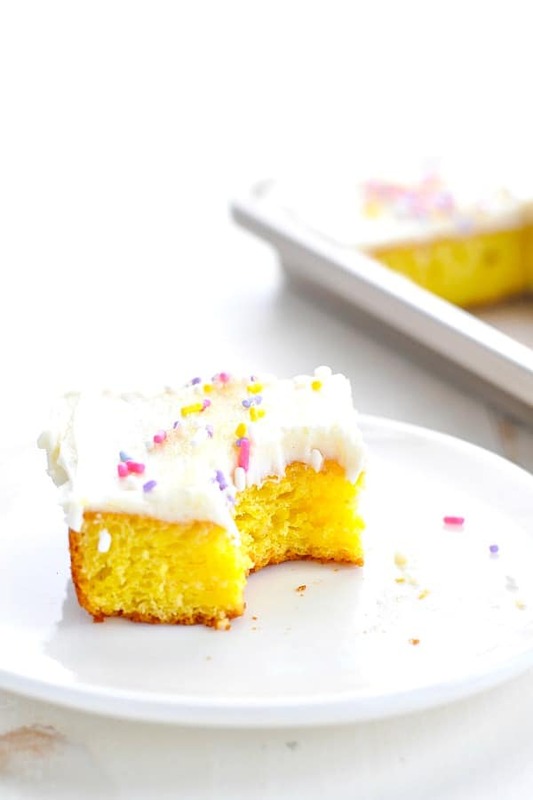 Make sure to use softened, room temperature butter to avoid a lumpy frosting. Make sure to cool the bars completely before frosting or it will melt and probably slide off. You can prep these bars in advance and store in a cool dry place until ready to serve or keep them in the freezer (before frosting). You can also frost the bars and keep them in the refrigerator for up to 2 or 3 days in advance. Decorate these bars with your favorite sprinkles. Spray or grease a 10 x 15-inch baking pan with non-stick spray. Bake for 30 minutes, or until golden brown and cooked through. Allow bars to cool on a wire rack. Once the bars are completely cool, prepare the frosting. Combine cream cheese, sugar, butter, and vanilla extract in a large bowl. Mix with an electric mixer to combine the ingredients, and then add 1 teaspoon of milk. Mix again until completely smooth and fluffy. If the frosting is still too thick, you can slowly add one more teaspoon of milk at a time until it reaches the desired consistency (I did not need more than 1 teaspoon of milk to get the frosting to a spreadable consistency). Fannie recommended using a 10-inch by 15-inch baking pan, so that's exactly what I did. I have not tested the recipe with a different size pan, although a 9-inch by 13-inch pan would probably work well, too. The smaller pan, however, will result in thicker (more cake-like) bars. If you have a pan that is slightly larger than 10 x 15-inches, that would likely work as well (you will just have thinner bars). Ooh, these look so perfect – and so easy!! What an easy recipe, I just love lemon desserts!